Want to straighten your teeth for a more stunning smile but don’t want to wear visible retainers for the next two years? No problem! Zammit Orthodontics recommends the use of Clear Aligners / Invisible Aligners to help you straighten your teeth without any of the inconvenience of alternative braces. Dr. Zammit is highly qualified and experienced and the perfect choice to help you fit these aligners. What are Clear Aligners / Invisible Aligners? Most removable and traditional spring aligners or retainers help you to straighten your teeth by holding them in place until the gums and bones adapt to maintain the position permanently. Unfortunately, they look unsightly with thick plastic and heavy wires, and make it difficult to clean your teeth or eat anything chewy. Our Clear Aligners / Invisible Aligners however get around this problem by using a transparent gum-shield-like aligner that you can take out to eat or to brush your teeth. Better yet, because you’ll get new aligners as your teeth change shape, it’s actually quicker and more effective than using conventional retainers. The end result? The benefits of regular retainers with none of the embarrassment or inconvenience. Clear Aligners / Invisible Aligners are not suitable for every patient, which is why we offer a free consultation with Dr. Zammit first with no obligation. Step 1: Get in touch on (905) 682 8375 or (905) 894 5903 and have a free no-obligation consultation with Dr. Zammit. Step 2: Come and visit our practice and we will make impressions of your teeth. 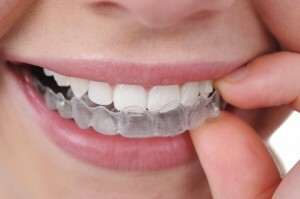 Step 3: Our technicians will create your aligners and you can start wearing them right away!